The monkey has known videos come out a bit later than the track that they’re for but fourteen years later is ridiculous. But then MF Doom (or DOOM, or whatever he’s calling himself these days) has never been one to follow the well-trodden path of convention and so the tardy arrival of the animated One Beer video for the track off 2004’s MM..Food isn’t entirely surprising. 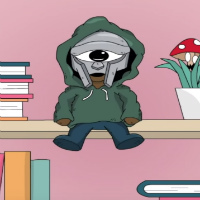 Turns out that the video in question is by animator/ director Anhia Zaira Santana a.k.a Distortedd (who was probably in a pram when the LP came out) and delivers an appropriately Adult Swim-ish scenario in which a one-eyed Kid Robot-ish DOOM figure eyes up a beer being drunk by a one-eyed Japanese school girl (yes, we get to see her underwear) shortly before the schoolgirl in question downs a mushroom and everything goes psychedelic. Well – more psychedelic. Before you know it, she’s also become a Kid Robot-ish toy ending up sat on a shelf alongside DOOM and we’ve all learnt something about the price of taking drugs and jonesing for alcohol.